The trust has around 35 kg of gold and will deposit the gold which is not in day-to-day use of the temple. 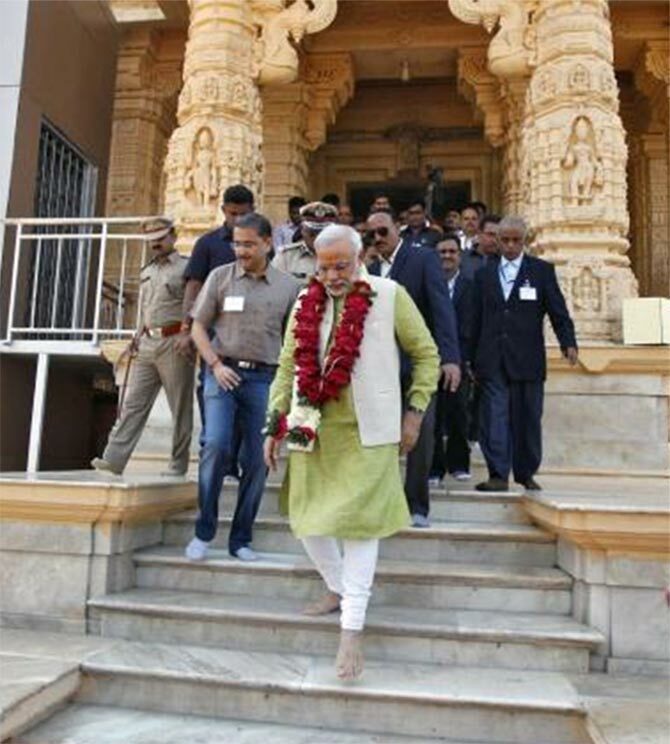 Image: Prime Minister Narendra Modi at the Somnath temple in Gujarat. The Somnath Temple Trust is all set to become Gujarat's first temple to deposit its idle gold in the gold monetisation scheme as its trustees including Prime Minister Narendra Modi have given their nod to invest the yellow metal reserves in the scheme. The decision was taken during the recently held meeting of trustees at Modi's residence in Delhi on January 12, said the trust secretary P K Lahiri, who is also one of the trustees of the Somnath Temple, situated in the Gir-Somnath district. "During the meeting, all the trustees have agreed to the proposal of depositing the gold, which is not in day-to-day use of the temple, in the gold monetisation scheme," said Lahiri. According to him, the trust is having around 35 kg of gold, which is either in the form of pure gold or ornaments. Now, the management will segregate the pure gold from the whole lot to finalise the quantum of gold which can be deposited. "We don't have a huge amount of gold. Majority of the gold is used for decoration on day-to-day basis in the temple. Thus out of that 35 kg of gold, we will separate pure gold which can be deposited under the scheme," said Lahiri. Other trustees of the Somnath Temple trust include former Gujarat Chief Minister Keshubhai Patel, who is also the chairman of the trust, veteran BJP leader L K Advani, Harshvardhan Neotia and JD Parmar. All these six trustees were present during the meet. BJP president Amit Shah was appointed as the seventh trustee during the meet on January 12. Gujarat has three main temples -- Somnath Temple, Dwarkadhish Temple in Devbhoomi, Dwarka district and Ambaji Temple in Banaskantha district. All of them are run by their respective trusts, which are governed by Gujarat Pavitra Yatradham Vikas Board. However, apart from the Somnath Temple, no other prominent temple in Gujarat, which has the capacity to deposit their gold, have shown interest in the scheme. While Dwarkadhish Temple body is yet to give a thought to the scheme, Ambaji temple authorities have outrightly rejected any possibility of depositing their gold in the scheme at present. According to Devbhoomi-Dwarka collector and ex-officio chairman of Dwarkadhish Temple trust committee H K Patel, no formal discussion has taken place yet among the trustees about depositing gold in the scheme. Banaskantha collector and chairman of Ambaji Temple trust committee Dilip Rana clearly ruled out any possibility of depositing their temple gold under this scheme. "At present, the work is underway to cover the main temple with gold. Whatever gold or cash we are receiving as donations at present, goes into decorating the outer layer of the temple. Thus, depositing gold under this scheme is out of question until this project gets completed," said Rana. Start-Up India: Good intent but will it actually work?